Learn all about how "Triggers" work and how to set them up! The Coupon Countdown app has 1 pre-set trigger right from the start, just enable it to see how the application works! This trigger gives 10%-off all inventory for all customers who spend 75 seconds on your site with a 10 minutes discount lifetime. Find out how to create a new trigger(s) using the information provided below. You will then be presented with the Trigger creation screen and progress bar. You setup the trigger to activate when a condition is reached. You then set the type of discount you want offered. Then setup the Desktop popup and success bar and Mobile bar and success bar. 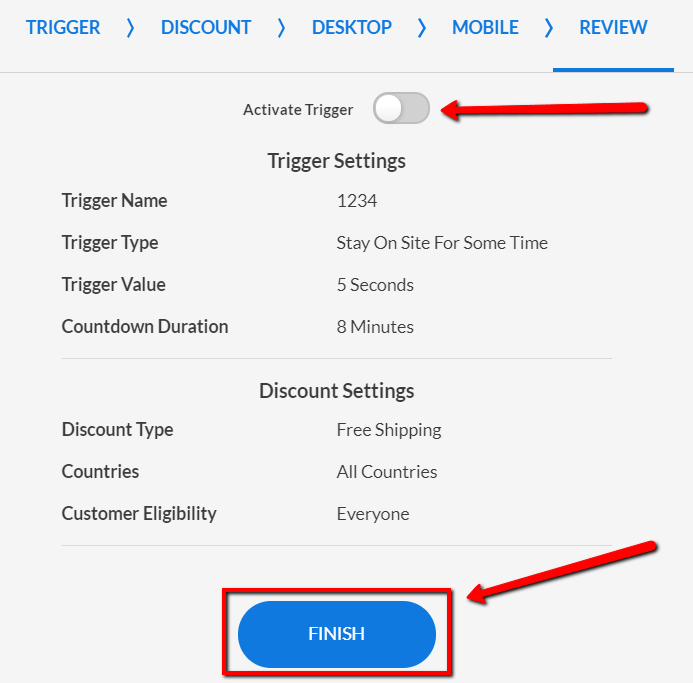 Review the trigger and discount settings before making the trigger live. Enter the trigger's name into the "Trigger Name” input field. Note: Your new trigger is inactive by default so you need to switch it to active later in the REVIEW tab or in the Triggers section of the app if you want it to go live. Choose a desired Trigger Type and specify the needed parameters. Countdown Duration - Enter the amount of time this discount will be valid for an individual customer. The default value is 8 minutes. The maximum value is 59 minutes. *Important Note: The discount popup countdown timer starts from this value and counts down. The time set here is the lifetime of the dynamically generated coupon. If the visitor makes it to the Checkout with the coupon, we add 20 more minutes. After completing a purchase, the coupon is being deleted from the Discounts section of your Shopify admin within 1 minute. Do not show this popup to the same visitor more than once per - Configure this setting to regulate the time before a particular trigger can initiate for the same customer again. The default value is "4 hours". 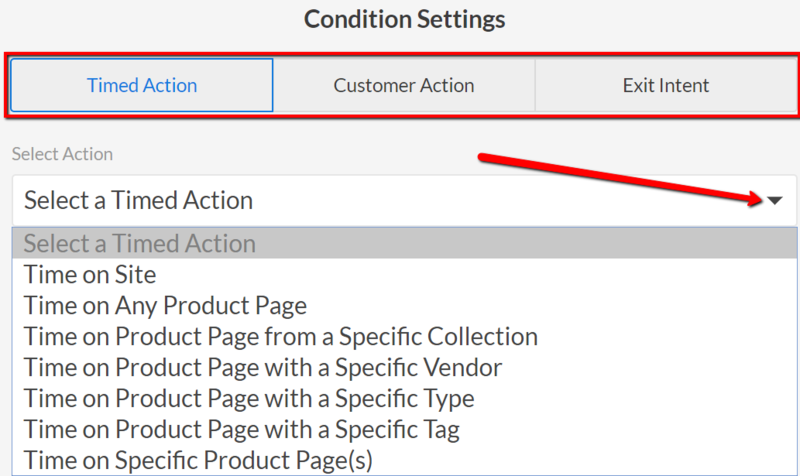 Maximum number of times the popup will appear per visitor (0 = unlimited) - Configure this setting to determine how many times a particular trigger can initiate for the same customer. The default value is "3". Set it to “0” if you need no limitation here. Once you're happy with your trigger's Conditions, Timer settings and configuration click on the "Next" button. 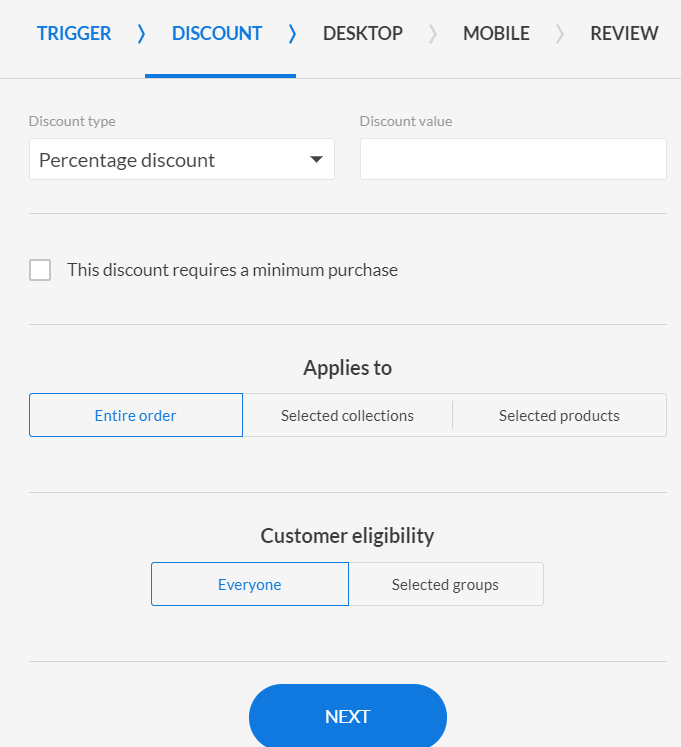 You will then be taken to the Discount Settings tab to setup the type of discount you want offered within the discount popup. Now it's time to configure the actual discount a customer gets when the conditions of this trigger are reached. In general, it replicates Shopify's discounts settings. Details about the discount settings available can be found here. Once you've set all of the discount settings and you're satisfied with them, click on the Next button at the bottom. You will then be taken to the Desktop tab to setup the popup and success bar appearance. Details about configuring a custom Desktop popup and success bar is the same as configuring the Global popup and success bar and can be found here. Once you've setup the Desktop popup and success bar, click on the Next button at the bottom. You will then be taken to the Mobile tab to setup the bar and success bar appearance. You can also apply the styles from the Desktop settings to your custom Mobile bar and success bar by clicking the "Apply" button for that setting. This can help save you some time if you want the same styles to be used on both Desktop and Mobile devices. Details about configuring a custom Mobile bar and success bar is the same as configuring the Global bar and success bar and can be found here. Once you've setup the Desktop popup and success bar, click on the Next button at the bottom. You will then be taken to the Review tab to review your setup and to make the trigger live by clicking the "Activate Trigger" switcher to the "On" position. Click the "Finish" button at the bottom of the screen to complete the trigger creation process. Congratulations, your new trigger is now completely configured and ready to go! There are two ways to enable or disable a trigger at any time. 1. Use the "Active" switcher right from the Triggers list page. 2. From the Trigger editing screen (accessible by clicking the Edit button) in the "Review" tab. NOTE: Some time is needed for a trigger to start working once it's created and enabled. Please, give it up to 10 minutes. A trigger can be duplicated by clicking the Duplicate button in the Actions column next to the desired trigger. NOTE: A duplicated trigger will be disabled by default. A trigger can be removed by clicking the Delete button in the Actions column next to the desired trigger.